A/Prof Kristen Radford is a Senior Research Fellow and NHMRC CDA Level 2 fellow. She completed her PhD in 1997 from the University of Newcastle, NSW and was awarded NSW Young Australian of the Year in 1998. She then undertook a postdoctoral position at Imperial Cancer Research Fund, London (now Cancer Research UK) developing new dendritic cell-based vaccine strategies for cancer immunotherapy. 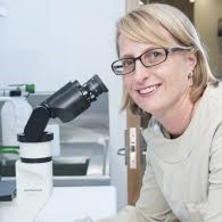 She joined Mater Research in 2001 and played a key role in obtaining the preclinical data that justified the first blood dendritic cell vaccine trial in prostate cancer that was completed in 2009. Her research interests are focussed on understanding basic dendritic cell biology in humans and applying this knowledge to develop more potent cancer vaccines. Developing novel immunotherapies for childhood blood cancers using advanced, humanised mouse models. Radford, Kristen J., Shortman, Ken and O'Keefe, Meredith (2013). Dendritic cells in autoimmune disease. In Noel R. Rose and Ian R. Mackay (Ed. ), The autoimmune diseases 5th ed. (pp. 175-186) San Diego, United States: Elsevier. Radford, KJ, Thorne, RF and Hersey, P (1997) Regulation of tumor cell motility and migration by CD63 in a human melanoma cell line. Journal of Immunology, 158 7: 3353-3358. Pang, E. S., Macri, C., Pooley, J., Fancke, B., Lundie, R., Hochrein, H., Radford, K. and O'Keeffe, M. (2016). Characterising the effects of interferon lambda on dendritic cells. In: International Congress of Immunology (ICI), Melbourne Australia, (374-374). Aug 21-26, 2016. Chang, K., Minoda, Y., Leal Rojas, I, Tullett, K. and Radford, K. (2016). Enhanced activation of human CD141(+) DC and CD1c(+) DC in vivo with combined TLR3/TLR8 ligation. In: International Congress of Immunology (ICI), Melbourne Australia, (820-820). Aug 21-26, 2016. Yap, X. Z., Lundie, R. J., Macri, C. F., Rojas, Leal, I, Feng, G., Radford, K. J., Beeson, J. G. and O'Keeffe, M. (2016). Human dendritic cell interactions with P-falciparum provide insight into the development of host immunity to malaria. In: International Congress of Immunology (ICI), Melbourne Australia, (671-671). Aug 21-26, 2016. Tan, P. S., Tullett, K., Park, H-Y, Gruber, E., Radford, K., Nicola, N., Zhang, J-G, Shortman, K., Caminschi, I and Lahoud, M. (2016). Molecular basis for the efficient processing of antigens taken up by Clec9A, a DAMP receptor on dendritic cells. In: International Congress of Immunology (ICI), Melbourne Australia, (789-789). Aug 21-26, 2016. Tullett, K. M., Leal Rojas, I. M., Minoda, Y., Tan, P. S., Zhang, J. -G, Smith, C., Khanna, R., Shortman, K., Caminschi, I, Lahoud, M. H. and Radford, K. J. (2016). Targeting CLEC9A can deliver antigen to human CD141(+) DC for recognition by both CD4(+) and CD8(+) T cells. In: International Congress of Immunology (ICI), Melbourne Australia, (820-820). Aug 21-26, 2016. Winkler, Ingrid G., Barbier, Valerie, Radford, Kristen J., Davies, Julie M., Levesque, Jean-Pierre, Smith, Theodore A. G., Fogler, William E. and Magnani, John L. (2015). Mobilization of CD8(+) Central Memory T-Cells with Enhanced Reconstitution Potential in Mice By a Combination of G-CSF and GMI-1271-Mediated E-Selectin Blockade. In: 57th Annual Meeting of the American Society of Hematology, Orlando, United States, (). Dec 05-08, 2015. Cullup, H., Wilson, J., Lourie, R., Shen, Y., Palkova, A., Radford, K., Dickinson, A. M., Rice, A., Hart, D. and Munster, D. (2009). CD83 antibody prevents GvHD and does not impair GvL induction. In: Bone Marrow Transplantation. 35th Annual Meeting of the European-Group-for-Blood-and-Marrow-Transplantation, Goteborg Sweden, (S116-S116). Mar 29-Apr 01, 2009. Hardy, Melinda Y., Kassianos, Andrew J., Wilkinson, Ray, Vulink, Anneie, Hart, Derek N. J. and Radford, Kristen J. (2007). Residual lymphocytes in GM-CSF and IL-15 differentiated monocyte-derived dendritic cells enables cytotoxic T lymphocyte responses. In: Blood. 49th Annual Meeting of the American-Society-of-Hematology, Atlanta Ga, (302B-302B). Dec 08-11, 2007. Mckinlay, A, Radford, KJ, Gardiner, D, Khalil, D, Field, K, Burnell, F, Hart, DNJ and Vuckovic, S (2005). Human memory CD4(+) T cells maintained in the absence of antigen develop regulatory T cells capable of suppressing antibody responses. In: Tissue Antigens. 35th Annual SCientific Meeting of the Australasian-Society-for-Immunology/14th International HLA and Immunogenetics Workshops, Melbourne Australia, (581-582). Nov 29-Dec 02, 2005. Hardy, MY, Kassianos, AJ, Clark, GJ, Hart, DNJ and Radford, KJ (2005). Production of IL-2, IL-12, and IL-10 by human blood myeloid dendritic cells. In: Tissue Antigens. 35th Annual SCientific Meeting of the Australasian-Society-for-Immunology/14th International HLA and Immunogenetics Workshops, Melbourne Australia, (437-437). Nov 29-Dec 02, 2005. A new approach to the design and evaluation of T cell vaccines for cancer and infectious disease.